Companies used to speak to their employee population as one group. Then came the Baby Boom. Then the older Boomers had children, and then younger Boomers had kids. Now we find ourselves with five dedicated employee groups that need to be understood and appreciated in terms of how you communicate with them: Traditionalists, Baby Boomers, Gen Xers, Gen Y (Millennials), and, now, Gen Z. The differences in work behaviors and benefits preferences have never been greater – not only regarding how generations communicate, but where they are when they need to be reached. How many of your employees are part-time, work-from-home, in distant locations, or mostly on the road? Those issues often create a situation where meetings or even phone calls are not the most efficient, effective ways to get in touch. As open enrollment approaches, you’ll need to communicate benefits options and instructions. A recent survey of Fortune 500 executives learned that 80 percent of them find communication across generations to be one of the most challenging issues in the workplace. In fact, many businesses are paying more attention to the generation gap now than ever before, and it all essentially boils down to how different generations perceive technology...and use it. How can offices streamline communication when every generation has a preferred communication method? You need to find a happy medium with communication methods that embrace technology, satisfy different generational preferences, and reach all of your target audiences. No small task, but definitely possible. Generation Z, which has not yet been assigned a clever name, essentially represents employees born between 1995 and 2001. These are people who have always had a smart phone, tablet or laptop in their lives. It’s how they get information, process and analyze it, and, ultimately, how they communicate. But they don’t necessarily use the smart phone to make a call (it’s a small computer, not a telephone to them); they use it to connect on social media. Generation Y or Millennials (1977-2004) are equally adept at using social media but are notorious “texters.” Instant messaging is easy and immediate. Much like Gen Z, Millennials have grown up with technology at their fingertips. They view technology as a critical part of their lives and work. They are constantly connected and tend to adapt quickly to new technologies for socializing and working. Generation X (1966-1976) are knowledgeable about and receptive to technology. They still use email and have adapted to using social media, but they are flexible enough to be receptive to in-person or phone communication. Gen X’ers mainly use technology for convenience purposes, such as online banking and shopping. Technology has yet to become central to their social lives, and this will likely remain the case. Baby Boomers (1946-1965) tend to prefer face-to-face communication or phone conversations. They have adapted (or are in the process of adapting) to online communication technology, but it’s not second nature as it is with younger employees. Traditionalists are the “meeting” generation. In-person meetings offer a great value in contributing to interpersonal relationships and group collaboration, but they can be time consuming and expensive when commuting costs accumulate. How do you find a happy medium when every generation communicates in different ways? Incorporate a blend of multiple communication methods that embrace technology but do not completely abandon previous communication preferences. In the past, workplace communication was primarily conducted through phone or in-person meetings. Then email became the go-to method. That has now migrated to social media platforms and online messaging. But by “fusing” these communication methods you can create a balance that helps every generation feel comfortable. Does this mean face-to-face, phone and email should be eliminated completely? Not at all. However, texting and other more “instant” forms of communication provide fast, responsive ways to reach your employees. It also speaks well to Gen Z and Millennials regarding the company’s commitment to technology and appreciation for how they prefer to communicate. The following is by no means meant to be an absolute breakdown of how and when these different communication methods can and should be used, but it gives you an understand of the strengths of these methods and can help you make the best decisions. Need to make an emotional connection? Do it in-person. Need to impart details and create immediacy? Use Mobile Messaging. Need to follow up on messages? Use the phone. Need to create a “paper trail”? Email could be your best answer. But wait…there’s a new player in town. Enterprise Social Networking (ESN) has taken the familiar look and navigation of sites such as Facebook and adapted it to the corporate world. You can now use tools like Slack, Yammer and Chatter to send messages and open up intra-office communications. ESN is generally searchable, allows file sharing, and provides an instant, easy way to communicate. You’re not just communicating, you’re marketing. Make sure your subject lines or titles and the headlines of your messaging grabs the attention of the employee. Set the hook. Give the employee whatever incentive you can. In other words, what’s in it for them? Use plain language. Jargon or overly-corporate writing is, frankly, a turn-off to employees. Talk to them like they’re sitting across from you, not as though you’re lecturing to them. Be as personal as possible. Speak their language. Talk directly to them. And keep it short and simple. Use creativity. Use whatever you can – typography, video, links to your intranet to attract attention and make getting the information as interesting and entertaining as possible. Send. Re-send. And then re-send again. 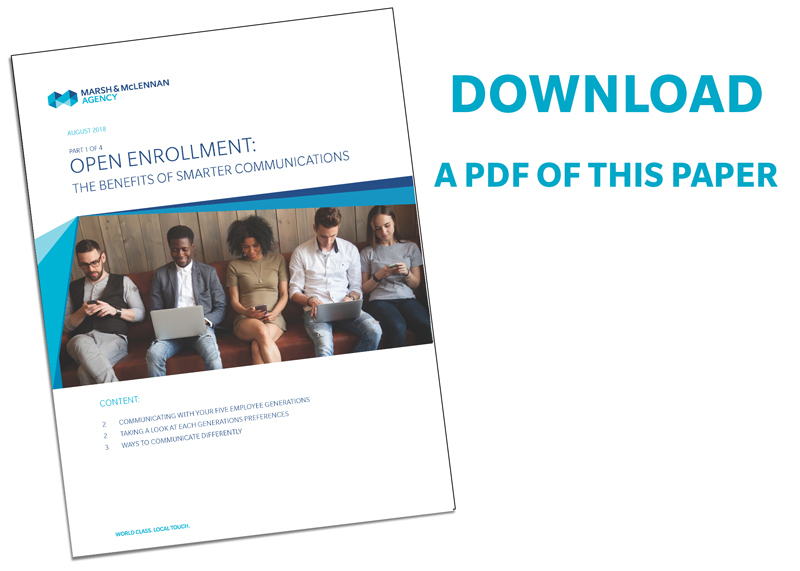 Communicating open enrollment information to employees is much like a mini ad campaign. You not only have to make it compelling and interesting, you need to make sure everyone gets the message. That requires multiple “touch points.” So, don’t be afraid to repeat the message. Most employees won’t notice or pay attention to all of them, but one or two will capture their focus. Mix up your “media.” We talked earlier in the article about which communication methods work best, but a good rule of thumb is to use a variety of channels to push your message. Use an ESN, then email, put up posters, and then follow up with texts or phone calls. Think as wide and deep as possible. Marsh & McLennan Agency can work with you to develop just the right plan for your organization. To learn more about communicating with employees about Open Enrollment, watch for more articles in this series. You can also contact your MMA representative to set up a meeting to work through your plan. Is An EAP Worth The Investment? Is Marijuana the Answer to the Opioid Addiction Problem? What are the Government's Plans to Solve the Opioid Problem? Can Telemedicine Make Health Care Benefits Healthier?